This video shows you the steps for year-end filing, which can also be read below. In terms of s 68(2) of the Income Tax Act, all employers must prepare and submit to IRAS Form IR8A and Appendices 8A and 8B or Form IR8S, where applicable, for every employee by 1 March each year. These can be filed manually or electronically; however, employers falling into certain categories are required to submit electronically under the Auto-Inclusion Scheme (AIS). For more information about which employers fall into the AIS, please visit the IRAS website. Under AIS, employers submit their employees’ income information to IRAS electronically and, therefore, do not need to provide employees with hard copies of the above forms. Employees can view their employment income on their payslips and their auto-included income via the Income, Deductions and Reliefs Statement (IDRS); however, employers may wish to provide employees with a statement of earnings for their records. As stated above, certain employers are compelled to participate in the AIS – such employers who have not received any notification from IRAS should contact IRAS immediately via email. IRAS encourages all employers falling outside the above categories to join the AIS voluntarily. Registration can be done via the IRAS website. SimplePay supports IR8A submissions to IRAS, and the report is generated in a format compliant with the IRAS AIS Salary File Validation and Submission Application (The IRAS Application – available here). The user guide on how to use the IRAS application can be found here. Ensure that In the Auto Inclusion Scheme? is set by going to Settings > Employer Filing Details to ensure that the IR8A is generated correctly for AIS Submissions. If you are also required to do IR8S, Appendix 8A and Appendix 8B submissions, we recommend downloading the IR8A from SimplePay and using the IRAS Offline Application (available here) for the rest. The user guide on how to use the IRAS Offline Application can be found here. Before proceeding to download the IR8A, please ensure that all payslips for the relevant period have been finalised. You will also need to add any outstanding take-on balances from the relevant employee’s payslip screen by going to the employee’s profile and clicking on Take-On Balances under Edit Info. This is necessary if payslips were issued to employees before you started using SimplePay. Go to the Filing section on the left-hand menu. Click IRAS Filing (IR8A etc.) under Non-Monthly Submissions. Under the Filing Seasons menu on the right-hand side, click on the relevant end date (e.g. 2016-12-31). 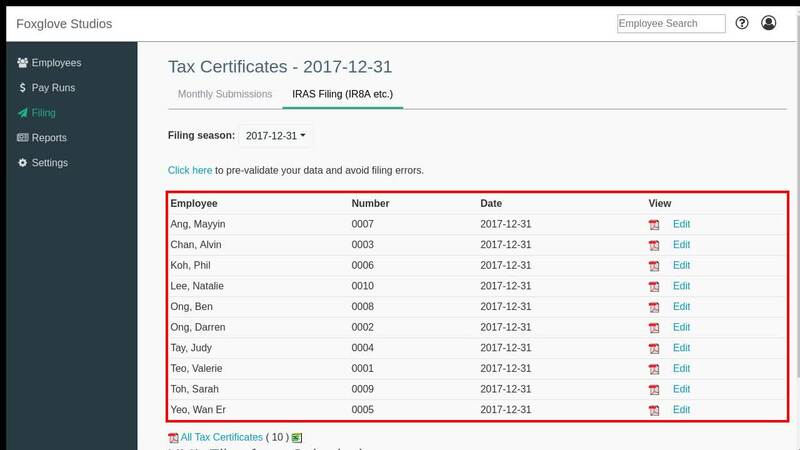 You can view an employee’s IR8A by clicking the PDF icon under View next to their name, or you can view All Tax Certificates. You can edit certain information, including Bonus declaration date and Directors fees approval date, on each IR8A by clicking the Edit link next to the relevant employee. You can also enter the total Benefits in kind value here. This will then allow you to complete the matching Appendix 8A document detailing the benefits for the employee later – note that SimplePay currently does not support generating the Appendix 8A. If you have an employee who is set as a foreign director under Basic Info and the employee received income that is categorised as Director’s Fees, you can also edit their IR8A to state whether Section 45 is applicable to the employee. When you are sure that all the information is correct, you can export the IR8A XML file for validation in the IRAS Application – this can be done by clicking IR8A under XML Files for e-Submission. Save the file in a convenient location with an easily identifiable name. Click Browse and select the XML file you saved above. If there are no errors, click Next to view your submission; otherwise, please contact SimplePay support for assistance. Once all validation errors have been resolved, repeat the export and validation procedures outlined above. Click Login to Submit and proceed to the myTax Portal.